KCBike.Info – Your City. Your Bike. Ryan Jones and crew are bringing back Pub N Pedal 5 this Saturday. The pub crawl and photo scavenger hunt is a great way to explore the city on your bike, meet cool bikey people, and have a great time. KC is fortunate to have not one but two community bike shops providing low-cost transportation options and skills training for local residents. This weekend both shops celebrate big milestones. 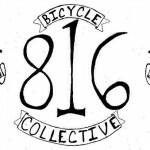 The 816 Bicycle Collective has been at 31st and Troost for more than five years, providing Midtown and East Side residents with low cost bikes and an earn-a-bike programs that teach people bike repair skills and result in free bikes at the end of the program. The Collective has plans for a new home at 31st and Cherry, and local architects recently donated services to design the renovations of an old warehouse at that location. Sunday evening at Californos in Westport the Collective unveil the designs for their new community bike shop at their 5th Annual Benefit Show, a fund raiser feature local music, great food, and a silent auction. Get all the details here. Revolve is launching KCs second community bike shop at 51st and Troost. They recently renovated an old gas station on the UMKC campus to provide bikes and bike education to UMKC and Rockhurst students and the adjacent neighborhood. Friday night is the shops grand opening, so stop by to check out the great renovation and the new services on offer. Lots of touring cyclists come through the crossroads that is Kansas City. This week a tour with unique twist is stopping here for an evening of dinner, film, and conversation. 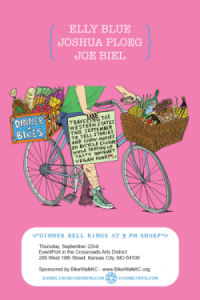 The Dinner Bikes Tour is traveling the US with a chef, a writer, and a filmmaker. Thursday evening they will serve a delicious vegan-friendly dinner, preview an upcoming documentary about bike culture, and lead a discussion about bike advocacy and bike culture around the country. BikeWalkKC is hosting this great event at their office in the Crossroads Arts District. Thursday, September 22nd, 7:00 p.m. The metros biggest farmers market is a popular destination for cyclists, but has always lacked bike parking. 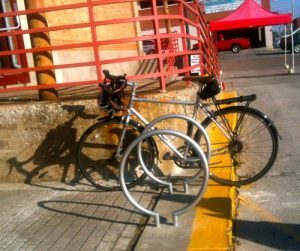 New racks now provide secure parking for people bicycling to the market for grocery shopping, lunch at market restaurants, or a cup of coffee. 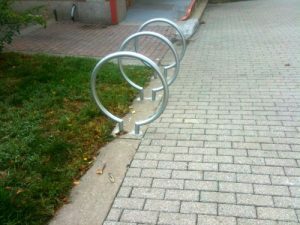 New hoop-style racks at three locations around the market have capacity for 16 bikes: The main entrance to the circle drive at 5th and Walnut, the north service drive on 3rd Street, and the northwest entrance from City Market Park and 3rd Street. Please be sure to use these racks when you visit the market. Showing high usage of the new racks is the best way to encourage market officials to add more bike parking in the future. 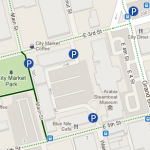 Find these and other bike racks on our metro bike parking map.